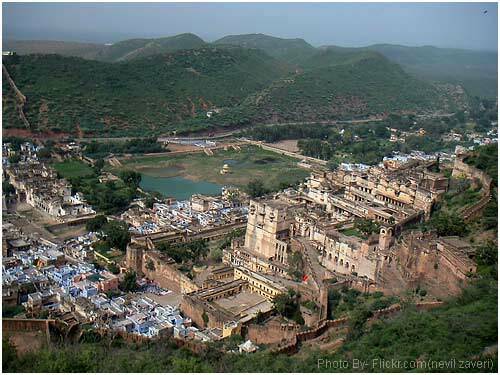 Taragarh Fort of Rajasthan is undeniably a renowned fort which stands out for its own identity in Bundi, Rajasthan. Taragarh Fort was the only place to an important generous state when it comes to the Rajput charm and grandeur. Taragarh Fort is a huge fort built in 1354 during the peak of Rajput rulers. It was made the capital of main princely states. This unique fort is accessible by a sharp road connecting up the hillside towards its entrance, which is decorated with wild elephants. The fort consists of huge pools etched out of hard rock and its Bhim Burj, which is the leading of the walls, on which is built up a renowned cannon. An outstanding birdeye of the city from this historical fort is one more attraction among explorers. It is believed that the Taragarh Fort was the first Hill Fort in India. The fort is also one of the oldest forts in Rajasthan that have seen a number of battles and rulers from Rajput, Muslim, Maratha and the British conquerors till date. The fort also has a historic Dargah of Hazrat Miran Syed Hussain Asghar Khangswar who was the governor of Ajmer at the time when Sultan Shahabuddin Ghori was the ruler here. But after the death of Qutubuddin Aibak, Chauhan and Rajput rulers combined attacked the fort and Miran Syed Hussain Asghar Khangswar was killed there. Taragarh Fort was very popular for its tunnels crossing the entire hillside. However, these tunnels are now unreachable for want of proper maps of Rajasthan. The main of its ramparts is the 16th-century bastion known as the Bhim Burj, on which was once mounted a particularly large cannon called Garbh Gunjam, or ‘Thunder from the Womb’.Taragarh Fort is a mark of previous Chauhan charm and has some huge water tanks in it. These water tanks were built to store water and supply it to the residents during a time of water crisis. The water reservoirs have been fixed out of the rocky base of the fort. There is a Rani Mahal in the fort which is a small palace within the compound, and it is built for the wives and concubines of kings. The Taragarh Mahal has, however, lost most of its charm as the shine of its remarkable mural works and the marked glass windows have entirely washed-out away within the time .The Taragarh fort also has a Miran Saheb ki Dargah. He was once governor of the fort and died in an encounter. This apartment is located in Nagpahari of Aravalli ranges, and the fort describes attractive archaeology and history. The gateway to the fort is designed by wild elephants. The huge reservoirs carved out of rock and Bhim Burj, the largest battlement, on which is mounted a cannon. It offers an excellent view of the town and bird-watching, which is another attraction among tourists.